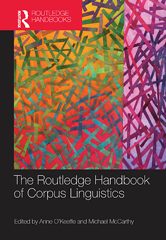 The Routledge Handbook of Corpus Linguistics provides a timely overview of a dynamic and rapidly growing area with a widely applied methodology. Through the electronic analysis of large bodies of text, corpus linguistics demonstrates and supports linguistic statements and assumptions. In recent years it has seen an ever-widening application in a variety of fields: computational linguistics, discourse analysis, forensic linguistics, pragmatics and translation studies. Bringing together experts in the key areas of development and change, the handbook is structured around six themes which take the reader through building and designing a corpus to using a corpus to study literature and translation. Each theme is preceded by a substantial overview of the area putting the subsequent themes into perspective.